The Glarner Stube’s structure and formal components are far from Swiss, rather a remedial dressing of Swiss elements have been concentrated to the most satiating zone for commercialism, the entrance. In the same spirit as Venturi’s Las Vegas, prominent Swiss elements conglomerate into one thematized sign at the entrance. A folly of sorts, this collection of themed pieces generates the character of the Glarner Stube that New Glarus seeks to epitomize. The subtle disruptive nature of American elements defines New Glarus, and many American themed environments. Interrupting the Swiss vision, everyday items intervene, like Brute trashcans, A/C units, or electrical wiring. These imbed a layer that complicates the overall aesthetic of the Glarner Stube, questioning its affect overall. At the grasp of consumerism, New Glarus obediently responds to an absurdly coherent set of codes – codes which encourage the built environment to assimilate into the realm of a commercially driven there, or there, there. The success of New Glarus depends on the perceivability and impact of thematized codes. According to Mark Gottdiener, “the more obscure the sign system and the more foreign the experience, the less able we are to use the space in the manner we desire.” And if a Swiss architectural theme can enable commercial success, than the desirable codes for said theme are those that become physical manifestations of popularly understood, generalized images of Swiss vernacular. The implementation of these codes produce the there even though we are not actually there, but rather here. The there, there is realized. New Glarus’ approach to codes only allows for certain visual representation and does not allow the built to deviate from stereotypical forms found in a highly curated selection of images based on an American perception of Switzerland. Umberto Eco describes this condition, particularly in America, “the American imagination demands the real thing, and to attain it, must fabricate the absolute fake.” Following suit, strange conditions occur when the rebellious bones of non-conforming buildings are forced to thematize through the peculiar attachment of Swiss elements. In an environment where the public “is meant to admire the perfection of the fake and its obedience to the program,” all buildings must oblige by these meticulously curated codes. In the Village of New Glarus Building Construction code manual, Article II, titled Swiss Architectural Theme, outlines requirements for compliance to the theme. A Design Review Committee checks that all buildings abide by the outlined criteria. For example, inclusion of shutters, roof overhangs for all pitched roofs, and use of flower boxes on balconies. In 118-24, Supplemental architectural theme requirements, Section C.1 is titled Shapes, point A states, “the single most defining shape of Swiss architecture is the pitched roof with expansive overhangs, regardless of building size…” The language of which these design elements are described is particularly oppressive and interesting, with commanding authority. In the seminar we looked at Celebration, FL as a trend of completely controlled environment building. Celebration, FL is a development that epitomizes the realization of a falsified there, there. Strictly coordinated building design is a fundamental technique for “community building” in Celebration. Through their revived use of the traditional American Patterns Book, “the desired result and details of key elements such as porches or windows” are explicitly demonstrated through “three-dimensional images,” leaving very little room for unique interpretation. The blunt categorization of 6 architectural styles (Classical, Victorian, Colonial revival, Coastal, Mediterranean and French) is further broken down into their appropriate elements. How do we write building codes today to control the desired setting of a place? Setting is no longer about slow growth, but more so about creating sensational environments. Especially when considering examples like Wes Anderson, where his film’s memorability and recognition stem largely from his settings, settings which clearly associate with specific cultures. 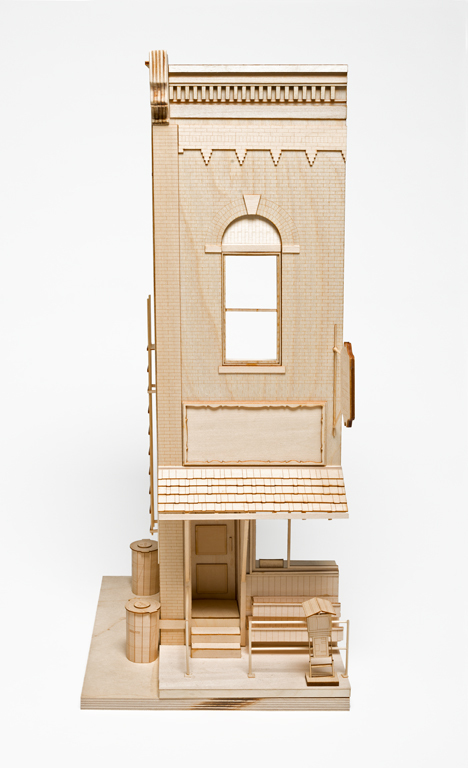 Mark Gottdiener, "Experiencing Themed Environments," 133. Umberto Eco, "Travels in Hyper Reality," 8. The 'Are we There, There!?' seminar is on how we can construct identities with images to share immediate cultural experiences. The class questions aforementioned characteristics, typical elements, and significations that create a character of a place and its culture. As designers we are interested in how we can actualize these codes through materiality and assembly techniques. As a case study of one of these towns, we examined New Glarus, Wisconsin over the course of the semester. Each student studied one building in New Glarus' Swiss section. 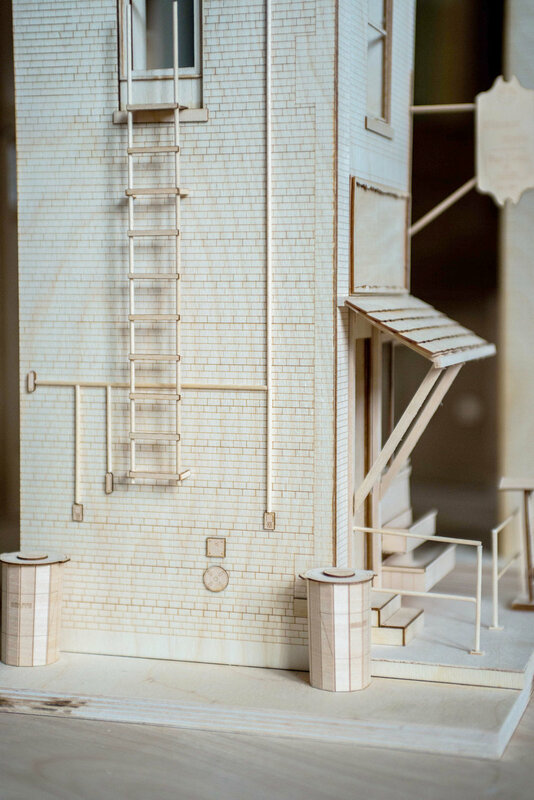 Through the production of a casagmi, a detailed physical model, and a figure of rhetorical parts model, all with corresponding drawings, we documented and deployed what currently flourishes under the Swiss themed building codes in Wisconsin's Little Switzerland.